A phone battery should last--even under heavy use--for the 16 or 17 hours from when you wake up until you go to bed. (I'm assuming that you recharge your phone at night.) Unfortunately, a great many phones can't always make it through the day. But there are settings that can extend the phone's battery life. Try turning off Wi-Fi, and set your phone to not automatically sync email, your calendar, or other cloud-centered apps. If you have an Android phone, consider removing some of your widgets; since their function is to show you live data, they have to be working at all times. You might also want to remove other power-hungry apps. 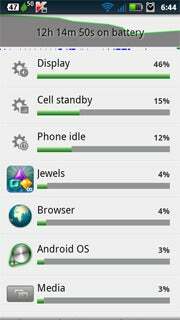 If you have an Android phone, go to the launcher (what Windows users think of as the "desktop"), press the Menu button and tap Settings>Battery & data manager>Battery usage to identify the hogs. If that doesn't help, look for places in your daily routine where you can conveniently give your phone an extra charge. If you drive a lot, get an adapter for your car's cigarette lighter and charge while driving. Or plug the phone in when working at your computer. I often listen to music off of my phone while working in the kitchen, with the phone plugged into both a pair of speakers and a recharger. If none of these solutions seem practical, invest in a backup battery. I occasionally use a PowerSkin--a special case with a battery inside--for this purpose. I find the PowerSkin too bulky for every-day use, but if I'm going to be away for the day, I make sure it's charged and toss it in my backpack. For more details, see my review. 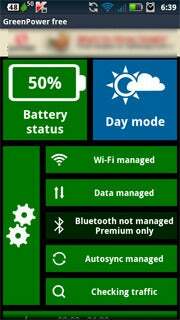 GreenPower Free automatically manages WiFi, data-synching, and other power-draining features. Once you've set it up, you can pretty much forget it. Battery Indicator shows you your power consumption. It can display remaining power in increments of 1 percent, even on phones that otherwise only display 10-percent increments. (For instance, my Droid X currently tells me I have 90 percent, but Battery Indicator reports 86.) It also gives you a quicker route to get to the battery usage screen.